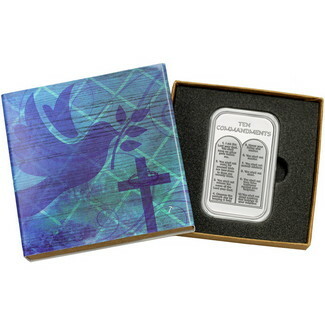 Ten Commandments 1 Ounce .999 Silver Bar Design depicts the stone tablets with each of the Ten Commandments written out, 5 on each side: "1. I am the Lord your God. You shall have no other gods before me." "2. You shall not make for yourself idols nor bow down to them nor worship them." "3. You shall not misuse the name of the Lord your God." "4. Observe the Sabbath day by keeping it holy." "5. Honor your father and mother." "6. You shall not murder." "7. You shall not commit adultery." "8. You shall not steal." "9. You shall not bear false testimony against your neighbor." "10. You shall not covet anything that belongs to your neighbor."